Judicial Retirement Laws of the Fifty States and the District of Columbia, the first comprehensive work on the subject, brings together a complete survey of existing judicial retirement laws in all fifty-one jurisdictions. 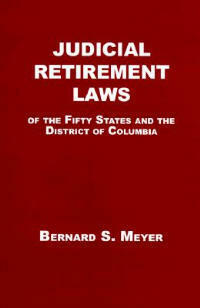 Using appropriate constitutional and statutory citations, Bernard S. Meyer identifies, in each jurisdiction, provisions for mandatory retirement on account of age, for retirment for disability (voluntary and involuntary), as well as for further judicial service after retirement. This work also suggests how these laws should be changed for the improvement, and the interest, of justice.